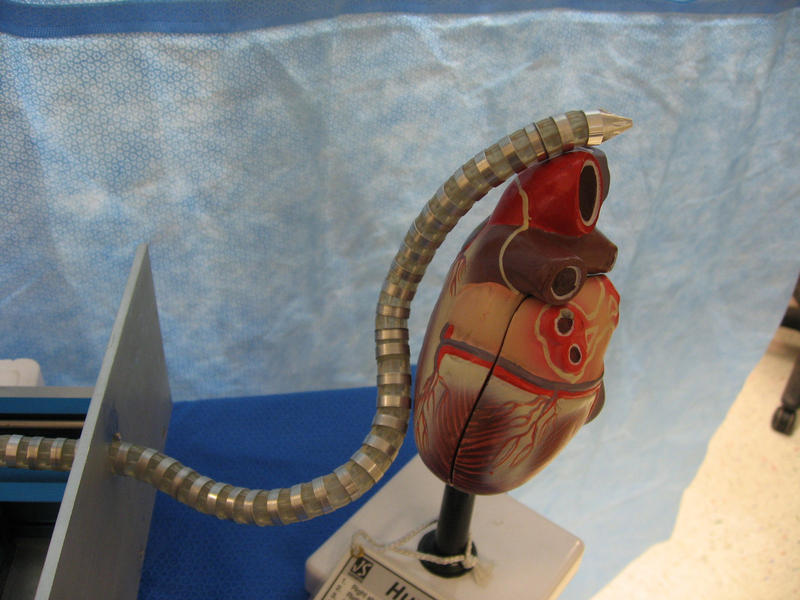 In order to overcome the limitations of currently available assistive technologies for minimally invasive cardiac surgery (MICS), we develop and tested a first prototype based on an innovative approach of a highly articulated robotic probe (HARP). We hypothesize that, for procedures involving epicardial interventions on the beating heart, MICS can be effectively realized with the HARP, entering the pericardial cavity through a subxiphoid port, reaching remote intrapericardial locations on the epicardium without causing hemodynamic and electrophysiologic interference, attaching to the target surface, and delivering therapeutic interventions under the direct control of the surgeon. We strongly believe that HARP’s functionality will eventually lead to application such as multiple intrapericardial therapies (e.g. cell transplantation by intramyocardial injection, epicardial ablation, epicardial lead placement for resynchronization, etc). Our broad, long-term objective is to fulfill our group’s “epicardial frontier” vision, enabling a growing portfolio of epicardial therapies by developing and testing new dedicated innovative robotic technology. We envision the adoption of HARP-based intrapericardial therapies not only by minimally invasive cardiac surgeons, but also by interventional cardiologists and electrophysiologists. Left: A real-time graphic reconstruction of the snake robot navigating around a CAD model of the heart, which was obtained the night before the procedure. Left: The snake robot enters the subxyphoid process, enters a small incision in the pericardium and then navigates to the left atrial appendage. Here, we made a large incision on the side of the pig to view the robot. Left: The snake robot enters the subxyphoid process, enters a small incision in the pericardium and then navigates to the left atrial appendage. Here, we display images from the optic fiber on the robot. Left: A live fluoroscopic image of the snake robot navigating around a porcine heart.